File2008.27.2 - "Annual Report of the Topographical Survey"
Knox Freeman McCusker ("Mac") the son of Rev. 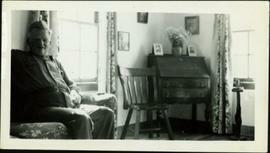 Samuel and Mary McCusker (nee Orr) was born on 6 April 1890, in Hawkesbury, Ontario. He received his education at the Gault Institute in Valleyfield, Quebec and at Queen's University in Kingston, Ontario. In 1909 he joined the staff of the Topographical Surveys Branch in the Federal Department of the Interior; in 1914 he was granted the commission of Dominion Land Surveyor. His work with the Topographical Surveys Branch included initial meridian, baseline and subdivision surveys and exploratory mapping. In 1927, he guided Marland Oil Company officials in prospecting an area to the west and north of Fort St. John and from the information gathered, he drafted the original Hudson Hope eight mile to one inch map sheet. 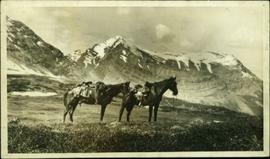 After being laid off in 1930 as a result of the Great Depression, Mac took up guiding in British Columbia’s Peace River region including the Liard and Dease River areas and up into the Yukon. One of his most famous guiding commissions was with the Henry Expeditions. 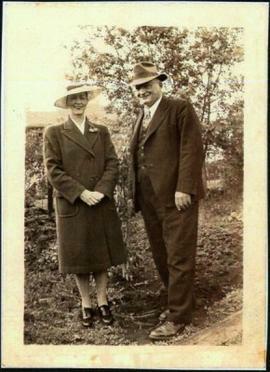 In 1931, Dr. J. Norman Henry (prominent physician) and Mrs. Mary Gibson Henry (pioneer amateur botanist), a wealthy and adventurous American couple from Philadelphia, commissioned McCusker to guide them and their four children to the elusive "tropical valley" located near the Yukon border – a geographical phenomena they had heard so much about on a previous trip to Jasper, AB. This 79-day expedition lead them to the Toad River Hot Springs, and while the exotic “tropical valley” of their imagination may not have been fully realized, Mrs. Henry did amass an extensive collection of plants en route – a collection which fuelled her passionate interest in botany and spurred her to revisit north eastern BC another three times: in 1932, 1933 and 1935. 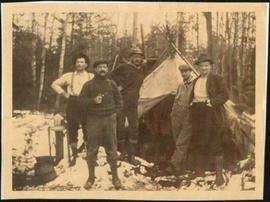 On the Henry expeditions whenever the outfit stopped to rest, McCusker and Mary Henry would climb to the top of the nearest mountain. Mac would get his bearings and work on his maps, while Mary Henry would work on her plant collection. The information McCusker acquired on these trips contributed substantially to the geographical knowledge of the area, and his maps formed the basis of many of the subsequent topographical maps of the area. 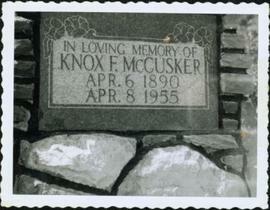 Many of the landmarks in the area were also named as a result of McCusker's efforts, as can be seen in names such as Mt. Mary Henry, Mt. St. Paul and Mt. 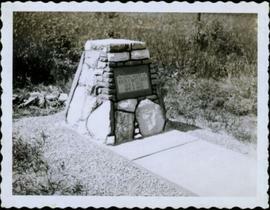 St. George, Beckman Creek, and Falk Creek - all named after individuals involved in the initial 1931Henry Expedition. 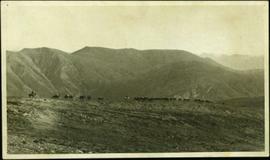 As well, the Alaska Highway (construction for which beginning in 1942) followed part of the Henry expedition route. Due to his specialized topographical knowledge of the area, McCusker was involved with many aspects of the Alaska Highway Construction project: including the coordination of fuel and supply movement into Fort Nelson during the winter of 1941-42; advising on the layout of the highway route; organizing pack outfit support during construction, and supervising the building of construction camps. This knowledge ultimately contributed greatly towards the location and construction of the Northwest Staging air route and the Alaska Highway - both wartime projects of high international priority. In acknowledgement for his wartime efforts, "Mac" received the Certificate of Merit from the United States Public Roads Administration. In 1944, Knox McCusker married Gwen Elliott in a ceremony in Edmonton and the newlyweds spent their honeymoon conducting a legal survey of the Alaska Highway in the Yukon that summer. 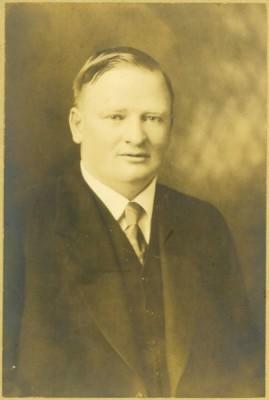 From 1950 until his passing in 1955, McCusker was in the employ of the Department of Public Works, Edmonton, making subdivision and other surveys in the Peace River Country. 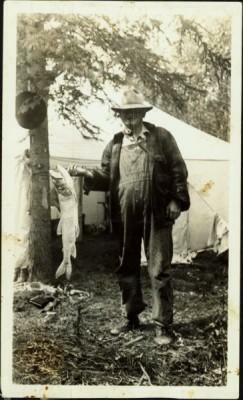 Knox Freeman McCusker passed away in Fort St. John on 27 April 1955 at the age of 65. The Knox McCusker Collection consists primarily of photocopies of publications written by Mary Henry (1931-1935); annual reports; articles and papers written about Knox McCusker (1935-1997) as well as research materials pertaining to his life; articles and speeched written by Knox McCusker and general correspondence regarding surveying. Aside from these photocopies are some original records; namely: original correspondence between McCusker and G.G. Aitken (1934-1938); photographs (ca. 1930-1950); McCuskers 1909 certificate enabling him to be an Articled Pupil with the Dominion Land Surveyors; and an interview with McCusker conducted by J. Frank Willis (CBC, 1954).